By imprisoning a highly influential blogger whose only weapon was his photo camera and laptop, the Vietnamese Government dealt a very harsh blow at freedom of expression. After a trial that lasted for only three hours - too short it may seem for such an allegedly serious crime - Dieu Cay was sentenced 12 years in prison, while Ta Phong Tan, a woman blogger received 10 years, and Phan Thanh Hai, aka blogger AnhbaSG, 4 years. Analysts said AnhbaSG was given the slightest sentence for having admitted before the court that he was wrong, he felt remorse and would cut off all relationships with “anti-state elements.” This verdict for AnhbaSG was something his family and friends all knew ahead of the trial. All of the three bloggers were convicted under Article 88 of the Penal Code of Vietnam, a vague provision making “anti-state propaganda” a crime. outside the September 24 trial court. Dung was stripped of his Free Dieu Cay T-shirt. “Dieu Cay”, which means “Peasant’s Pipe”, is a very Vietnamese nickname that a Vietnamese blogger can think of. And it’s the nickname of Nguyen Van Hai, a man who is really like a peasant in the sense that he is easy-going, amiable, and warm-hearted - at least his friends think so. Born on September 23, 1952 in the northern city of Hai Phong, Dieu Cay spent his youth in the Vietnam People’s Army in southwestern border battlefield in late 1970s. Dynamic as he was, Dieu Cay soon found ways of living after the war when he moved to the south and started up his own business, while the majority of northern Vietnamese people would in those days cling to the bureaucratic state apparatus and fade away in the public sector of a highly state-controlled economy. He used to run coffee-houses, sell cameras and other photo equipment, and rent out apartments. With such businesses, he led quite a well-off and sociable life. He had friends in various groups of the society: artistic circles, academic circles, students, as well as people from low classes. Most Dieu Cay’s friends said they were attracted by his charm, and that he is charismatic. In 2005 Yahoo! 360° came to Vietnam after officially launched on June 24th in the US. This was the first time the 22 million Internet subscribers in Vietnam, mostly youths, experienced a totally new form of reading, writing, and in general, a forum where they could express their ideas relatively freely. The period from 2006 to 2008 was the boom years of Yahoo! 360°, the dawn of a whole new world of Internet media. While politics remained a sensitive area to most Vietnamese bloggers, since 2007 Vietnam began to witness growing concern about political issues, especially since tensions escalated between territorial claimants in the South China Sea, notably Vietnam and China. Dieu Cay, in his fifties, adapted very quickly to the new media, and he proved to be an Internet-savvy man. In mid-2007, he developed his own Yahoo! 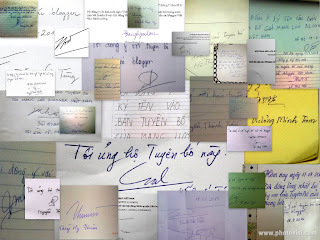 360° blog, to which he posted writings and photos of the life of people in contemporary Vietnam. For example, he told the story of how he got into trouble when the local People’s Committee alleged that his restaurant was using a foreign name; in fact, Mitau (the name of the restaurant) was just a central Vietnam’s dialect to mean “you and me”. His writings, with a sense of humor and bitter satire, reflected different aspects of a crippling rule of law, winning him high reputation as the first-ever famous political blogger in Vietnam. One example was what happened to Dieu Cay himself from late 2006 to mid-2007. Around November 2006, he was involved in a dispute with one neighbour, an official of the local cell of the Communist Party, who appropriated part of one of Dieu Cay’s apartments. Dieu Cay posted the photos of his apartment to blog and distributed the text copies of the case among neighbours and friends, which attracted attention of the local people who all had antipathy against that communist cadre. He also reported the case to local police, but the police, having taken bribery from the communist neighbour, put a fine on Dieu Cay for “inciting social disorder” rather than returning the property to him. He objected and took a lawsuit to a local administrative court. The court of June 28, 2007 ended up with Dieu Cay losing the lawsuit, but the photos, the voices recorded, and all the happenings inside the court were posted to his blog, describing a spurious, laughter-provoking “rule of law” and earning him huge attention from the public. On September 19, 2007, Dieu Cay and a few friends established the Free Journalists Network in Vietnam, FJNV. The idea of FJNV dated back from 2004 when a Communist Party member, also Dieu Cay’s friend, planned to set up an association of freelance journalists, but his application to form such an association scarcely received any feedback from authorities. Freedom of association, as are other freedom rights in Vietnam, is recognized in the Constitution but never realized in reality as it is hindered by many obstructive laws and regulations. So Dieu Cay precipitated the plan by founding FJNV “without permission”, and he developed its blog which he would use as a weapon similar to his personal one in the struggle for justice and freedom of Vietnamese citizens. With a laptop and a camera, he travelled to many places in Vietnam, talking to the disadvantaged of the society, including lost farmers and sweatshop workers, then writing stories about their life. He even exposed signals of corruption in the construction of Can Tho bridge that led to its collapse on September 26, 2007 in one of the most serious disasters in Vietnam’s construction history. In December 2007, first protests by bloggers broke out in Hanoi and Ho Chi Minh City, opposing China’s ratification of a plan to set up “Sansha City” to administer the disrupted Spratly and Paracel islands in South China Sea. Dieu Cay was a prominent figure when he attracted dozens of students who recognized the famous blogger and gathered around to listen to him. He was brutally detained by the police later on the way home. 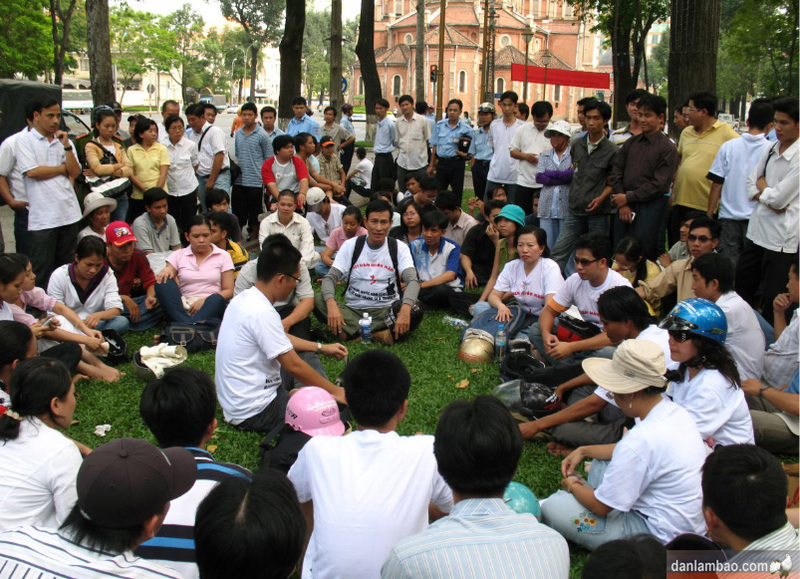 Dieu Cay at a protest in HCMC in December 2007. The woman in white on his left is Ta Phong Tan. Although he was released at the end of the day, Dieu Cay would from that time on be put under tight police surveillance. He was harassed very often, his business sabotaged by strangers in different ways, say, guests going to his café would find it impossible to find a parking place - the police would come and ask them not to put their vehicles there. They also intimidated any potential tenants of Dieu Cay so that he could not rent out houses, and they forced Dieu Cay to submit contracts dated even 10 years before. More seriously, Dieu Cay was regularly summoned to the police station for interrogation. Many interrogations lasted from 8am to 10pm with a lot of annoying queries about his activities and FJNV’s, his friends said. Above all, Dieu Cay was almost confined to his home as he was followed very closely. He even got hit in an accident that appeared to be deliberately caused by strangers. The mental tortures went on, but Dieu Cay made no appease. Things got worse and in around March, he left his home in Ho Chi Minh City to go on a travel, as his friends were told. Subsequently there was a whole campaign of the police chasing Dieu Cay. On April 19, 2008, he was “urgently arrested”, as police put it, in an Internet café in the southern city of Da Lat. No one was there to witness, so there was no clue of what the arrest warrant was actually based on. “Dieu Cay's arrest on 19 April came just a few days before the Ho Chi Minh City leg of the Olympic torch relay for which the government insisted on 'absolute security' and sanctions against any 'trouble-makers.' We do not think it was a coincidence and we call for him to be released pending trial,” Reporters without Borders said on May 15, 2008. Although the arrest was urgently taken, the house search was only conducted a few days later. All of Dieu Cay’s friends and family thought the search was just aimed at finding evidence his “anti-state activities,” but it was in vain, so the police turned to accusing Dieu Cay of “tax fraud.” Even in this case, however, they failed to follow a due justice process. Being handcuffed and secretly taken back to Ho Chi Minh City, put in custody without access to any lawyer or legal support, Dieu Cay was definitely declined all of his legal rights. The lawyer that Dieu Cay’s family hired later, Le Cong Dinh, who himself would be arrested just one year after and charged with attempting to overthrow the state, complained that he was not permitted to meet Dieu Cay during police investigation and not even notified of the trial date. Dinh revealed that only a few days after arresting Dieu Cay did the police begin to seize papers, so it was unreasonable when the People's Procuracy (of Ho Chi Minh City) initiated the prosecution against Dieu Cay’s “tax fraud” “based on some documents,” as it had said before the house search. Prior to the arrest, moreover, Dieu Cay had not received any notice from the local tax department related to his alleged “tax evasion.” All of the questions he was asked during hours of investigations focused on his blogging activities, especially on FJNV. On top of that, Le Cong Dinh found out that Dieu Cay, in fact, did not commit tax evasion. Rather, it was the police who requested the local tax department not to receive any overdue tax from both the landlord and the tenant without police permission. The request was made as far back as February 25, 2008. In other words, a trap had been set up for Dieu Cay long before his arrest. On September 10, 2008, Dieu Cay was sentenced 2.5 years in prison by the Ho Chi Minh City People’s Court. Ironically, on October 18, 2010, blogger AnhbaSG, also an FJNV member, was arrested, just one day before Dieu Cay completed his prison term. Subsequently Dieu Cay remained in detention under the new charge of “spreading propaganda against the state.” A couple of question may be raised: How could Dieu Cay “spread propaganda against the state” during his 2.5 years of imprisonment? Would there be another charge waiting for him when he completes this second prison term? Would he survive after a dozen more years languishing in prison where he has been being totally isolated from the outside world? Not any concept of time, information, reading materials, privacy, social contacts (even with family), or hygiene foods at all – that’s the life in a typical Vietnamese prison. Dieu Cay’s family also fell victim to government harassment. The police kept close eyes on his ex-wife, and she could not enjoy any free time with friends and acquaintances. Dieu Cay’s first son, Nguyen Tri Dung, was even confined in his home on the day of his final examinations, so that he failed to attend them to receive the degree. 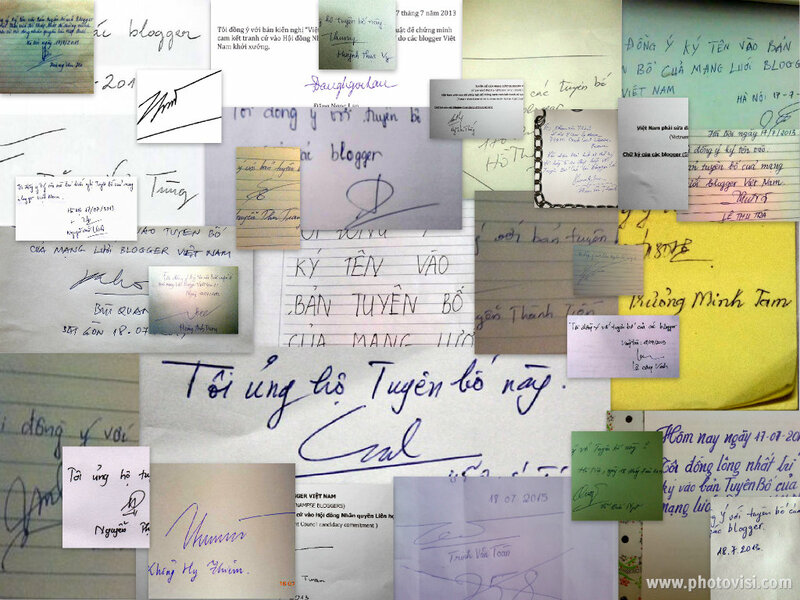 In the months before the 2012 trial of Dieu Cay, an online petition was organized with thousands of people signing an open letter to President Truong Tan Sang, demanding “freedom for Dieu Cay”. Many bloggers produced black T-shirts with the slogan “Free Dieu Cay, freedom for the patriot”. The atmosphere was so tense that the police-dominated People's Procuracy had tried to keep the trial date secret. In the end, the appeal court of December 28 confirmed the sentence against the three bloggers. What lies ahead of Vietnam’s blogging community, after all? While the government, obsessed by an “Arab Spring” scenario, gives no sign of appeasement, and bloggers’ dissatisfaction keeps growing, a certain answer seems impossible. However, while the majority of people assume that democratization is an inevitable process with the expansion of globalization, it is unlikely that the Vietnamese Communist Party and their security apparatus have the same belief in the bright future of communism. The fight will go on. Vào khoảng 20h ngày thứ năm, 18/7/2013, 69 blogger và facebooker (gọi chung là blogger) Việt Nam đã đồng loạt công bố trên mạng bản Tuyên bố của mạng lưới blogger Việt Nam. Tựa đề và nội dung chính của Tuyên bố này là yêu cầu “Việt Nam phải sửa đổi pháp luật để chứng minh cam kết tranh cử vào Hội đồng Nhân quyền Liên Hợp Quốc”. Thực ra, nếu có thể được bày tỏ ý kiến một cách công khai, có tổ chức và thẳng thắn hơn, các blogger có quyền nói rằng: Nhà nước Việt Nam phải chấm dứt việc lạm dụng luật pháp cho mục đích “quản lý” mà thực chất là để có lợi cho mình và gây thiệt hại cho người dân, cho xã hội. “Để thuận tiện cho hoạt động quản lý” là cái tư duy ăn sâu bám rễ đằng sau việc Nhà nước Việt Nam sử dụng hệ thống luật pháp và các văn bản dưới luật một cách tùy tiện, thỏa thích trong hàng chục năm qua, kể từ ngày thành lập chính quyền (năm 1945). 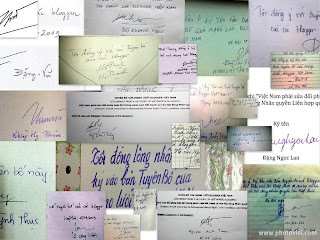 Tuy nhiên, nếu chỉ giới hạn trong hai năm 2012 và 2013 thôi thì chúng ta cũng đã chứng kiến thứ công cụ luật pháp ấy thể hiện sức mạnh của nó trong hàng loạt chính sách ích kỷ và vô tâm của chính quyền: Nghị định quản lý Internet cấm việc công dân phát biểu “vi phạm thuần phong mỹ tục” trên mạng; Thông tư về áp dụng mẫu chứng minh thư nhân dân mới có cả tên cha mẹ; Nghị định về xử phạt xe không chính chủ; cùng hàng chục quyết định tăng giá xăng dầu rất thoải mái của Bộ Tài chính. Một bộ luật tối quan trọng của bất cứ nền luật pháp nào là Bộ luật Hình sự cũng bao gồm rất nhiều điều khoản chứng tỏ sự lạm quyền, hà khắc tới mức vô lý của Nhà nước. Điều 79, “Tội hoạt động nhằm lật đổ chính quyền nhân dân”, không gì khác là sự đàn áp quyền lập hội và hoạt động đảng phái, tham gia chính trị. Điều 88, “Tội tuyên truyền chống Nhà nước”, và Điều 258, “Tội lợi dụng các quyền tự do dân chủ xâm phạm lợi ích của Nhà nước, quyền, lợi ích hợp pháp của tổ chức, công dân”, tiêu diệt tự do ngôn luận, cấm công dân được “nói xấu” nhà nước hay là nói những điều Nhà nước không thích nghe. Cần nói thêm rằng không phải chỉ chính quyền Việt Nam mới nghĩ ra việc lạm dụng luật pháp để có thể trục lợi, hoặc dành phần lợi cho mình (gọi là “tạo thuận lợi cho công tác quản lý, điều hành”) và đẩy khó khăn, thiệt thòi về phía người dân. Sử dụng luật pháp làm công cụ trấn áp, vẽ ra luật để xiết dân, là đặc điểm chung của mọi chế độ độc tài, toàn trị. Liên Xô từng luật hóa việc đàn áp đối lập chính trị bằng Điều 58 Bộ luật Hình sự năm 1927, theo đó, chính quyền có thể bắt giữ tất cả những công dân bị tình nghi là “có hoạt động phản cách mạng”, “kẻ thù của giai cấp công nhân”. Cũng nước Nga, năm 2012, chính quyền đã đưa ra một đạo luật tai tiếng nhằm vào các tổ chức phi chính phủ, kể cả tổ chức quốc tế như Ân xá Quốc tế, Giám sát Nhân quyền, và Minh bạch Quốc tế. Hàng trăm tổ chức ở Nga bị thanh tra, lục soát, thu giữ tài liệu. Luật “nhân viên nước ngoài” này của Nga bị coi như một đạo luật vi phạm nhân quyền và phá hoại xã hội dân sự. Quyền lực nào cũng tha hóa nếu không bị kiểm soát. Nhà nước nào cũng lạm dụng luật pháp, nhưng chế độ càng độc tài thì càng lạm dụng luật pháp nhiều hơn. Ở Việt Nam, cho đến nay, rất nhiều người, trong đó có những người ủng hộ dân chủ-tự do-nhân quyền, vẫn quan niệm rằng “gì thì gì, phải sống và làm việc theo đúng hiến pháp và pháp luật đã”, “chấp hành trước, đấu tranh thay đổi sau”. Quan điểm đó nghe có vẻ rất hợp lý, chỉ có điều người ta chưa trả lời được câu hỏi: Vậy nếu nhà nước cố ý tận dụng luật pháp làm công cụ để xâm phạm tự do của công dân, vi phạm nhân quyền, thì sao? Vẫn cứ phải chấp hành (không biết đến bao giờ)? Không có cơ chế bảo hiến, không có tòa án độc lập, không có quốc hội đại diện thực sự, người dân Việt Nam còn biết làm gì để bảo vệ tự do của họ trước Nhà nước? Đây là lý do đưa đến câu cửa miệng của nhiều người: “Thì làm thế nào được, luật pháp trong tay chúng nó, luật là của chúng nó mà”. Trong lúc chưa thể có một sức ép nào đó buộc chính quyền phải xem xét lại hệ thống luật pháp, đặc biệt là những đạo luật quan trọng như Bộ luật Hình sự, thì việc vận động để xóa bỏ những điều khoản vi hiến như Điều 258 có thể được xem như một bước khởi đầu. Luật pháp, theo đúng nghĩa, là để bảo vệ tự do của người dân chứ không phải để bảo vệ quyền lợi của chính quyền. 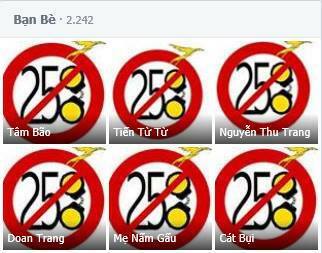 This is the first collective action by political bloggers in Vietnam who voice their opinions about Vietnam’s running for its membership in the United Nations Human Rights Council for the 2014-2016 tenure and, during the process, ignoring the role of its people. If they were able to openly express their opinions in an organized and straightforward way, the signers must have said that the Vietnamese State must stop abusing laws for the sake of “management”, which actually aims to benefit the State at the expense of the people. “To facilitate public management” is a deep-rooted mindset accounting for the fact that Vietnamese Government has used its system of laws, regulations and fiats at its discretion and out of its interest for dozens of years since the making of the nation in 1945. In the two recent years alone, Vietnam has seen many repressive laws manifested in a series of irrelevant, government-oriented policies: an Internet-controlling decree preventing Internet users from “violating fine customs and traditions” (but what is a fine custom and/or tradition? ); a circular on the application of a new ID card form requiring the bearer to submit their parents’ names (what if I were an illegitimate child wanting to protect his privacy? ); a decree on fining any citizen who fails to prove the ownership of their vehicle (does it mean I shall have to bring loads of documents with me whenever I go out? ); and dozens of discretionary decisions by the Ministry of Finance to increase fuel prices despite skyrocketing inflation. A crucial code of any legal system, the Penal Code, includes a range of repressive provisions. Article 79, “Carrying out activities aimed at overthrowing the people’s administration”, is nothing more than the suppression of the right to association and political participation. Article 88, “Conducting propaganda against the State”, and Article 258, “Abusing democratic freedoms to infringe upon the interests of the State”, inhibit freedom of speech in banning people to express any idea against the government or anything the government dislikes. Using legislations as a tool of repression is likely a common feature of all dictatorships and totalitarian regimes. The Soviet Union, for example, legalized repression of political opposition with Article 58 of the 1927 Russian SFSR Penal Code, according to which any suspect of counter revolutionary activities and enemy of workers is subject to detention. 85 years later, the Russian authorities issued a notorious legal policy targeting non-government organizations, including international ones such as Amnesty International, Human Right Watch, and Transparency International. Hundreds of NGOs were audited and raided, their documents confiscated. Russian “foreign agent” law is criticized for violating human rights and undermining civil society organizations. Power always becomes corrupt if it goes without a check-and-balance system. Every state tends to abuse laws; the more dictatorial it is, the more abusive of laws it becomes. 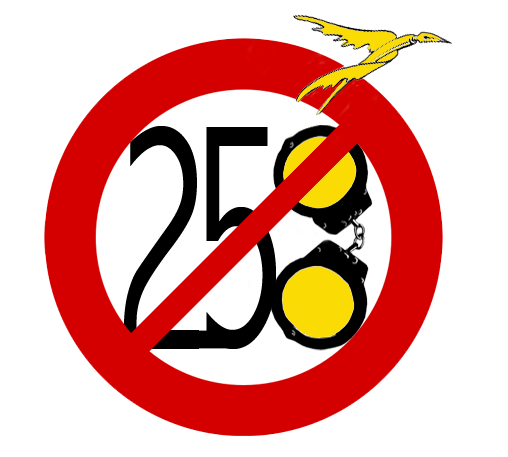 While the Vietnamese government is still free from any pressure to conduct judicial review, especially to revise such important law as the Penal Code, an effort to urge it to abrogate unconstitutional provisions, including Article 258, can be deemed as one of the first steps. Law, in its true sense, is created to protect the people’s liberty, not to protect the State’s interest. Hội đồng Nhân quyền Liên Hiệp Quốc (HĐNQ) có trách nhiệm tăng cường việc xúc tiến và bảo vệ nhân quyền trên toàn thế giới, giải quyết tình trạng vi phạm nhân quyền và đưa ra khuyến nghị. Là một ứng cử viên vào HĐNQ nhiệm kỳ 2014-2016, Việt Nam phải chứng minh các cam kết của mình nhằm hợp tác với HĐNQ và duy trì “những chuẩn mực cao nhất trong việc xúc tiến và bảo vệ nhân quyền”. Những nghĩa vụ và trách nhiệm này không chỉ được áp dụng trên bình diện quốc tế, mà còn trong nội bộ Việt Nam. Chính quyền Việt Nam cũng cần xem xét lại tình trạng vi phạm nhân quyền trên đất nước họ và nhân dân Việt Nam cũng phải có quyền tự do tư tưởng và biểu đạt, kể cả các vấn đề nhân quyền. Để cải thiện việc bảo vệ nhân quyền ở Việt Nam, chúng tôi sẽ thực thi các nguyên tắc của HĐNQ như những hướng dẫn cho các hành động của chúng tôi, vốn cũng đồng thời tuân thủ các nghĩa vụ của Việt Nam theo luật nhân quyền quốc tế. - Tiếp tục xúc tiến và truyền đạt đến người dân Việt Nam về các quyền của họ bằng cách phân phối công khai bản Tuyên ngôn nhân quyền, tổ chức các diễn đàn công khai để thảo luận về nhân quyền ở Việt Nam và vận động cho những sự cải thiện cần thiết trong việc tôn trọng và bảo vệ nhân quyền. - Tiếp tục giám sát, báo cáo và bình luận công khai về sự cải thiện, thụt lùi hay vi phạm nhân quyền ở Việt Nam, với sự tập trung vào vấn đề chính sách và thực thi chính sách ảnh hưởng đến nhân quyền do nhà chức trách Việt Nam tiến hành. Để hoàn thành những hành động có trách nhiệm này, chúng tôi kêu gọi chính quyền Việt Nam và HĐNQ xem xét lại Điều 258 của Bộ luật Hình sự năm 1999, sửa đổi năm 2009 – “tội lợi dụng các quyền tự do dân chủ xâm phạm lợi ích của Nhà nước, quyền, lợi ích hợp pháp của tổ chức, công dân”. Trong tháng Năm năm 2013, hai blogger đã bị tạm giữ ngay sau khi họ phân phát bản Tuyên ngôn quốc tế nhân quyền và cảnh sát cáo buộc họ “lợi dụng các quyền tự do dân chủ xâm phạm lợi ích của nhà nước”. Chỉ vài tuần sau đó, hai blogger khác cũng bị tam giữ sau khi tham gia một cuộc dã ngoại để thảo luận về các nội dung của Tuyên ngôn quốc tế nhân quyền. Gần đây nhất, trong tháng Năm và tháng Sáu năm 2013, điều 258 đã được sử dụng để bắt blogger Trương Duy Nhất, Phạm Viết Đào và Đinh Nhật Uy vì đã thực hiện quyền tự do biểu đạt bằng cách đăng tải các bài viết ôn hoà lên blog của họ. Điều này vi phạm điều 19 của Tuyên ngôn quốc tế nhân quyền: “Mọi người đều có quyền tự do tư tưởng và biểu đạt. Quyền này bao gồm sự tự do tư tưởng mà không bị cản trở, được tự do tìm kiếm, thu nhận và quảng bá tin tức và ý kiến qua mọi phương tiện truyền thông bất kể biên giới”. Sẽ là một trọng trách khi phụng sự như một quốc gia thành viên của HĐNQ, và là cơ hội để thúc đẩy nhân quyền ở trong cũng như ngoài quốc gia đó. Để thành công trong việc ứng cử vào HĐNQ, chúng tôi tin rằng Việt Nam phải bãi bỏ hoặc sửa đổi điều 258 để đảm bảo rằng nhân dân Việt Nam được tự do để tự học hỏi về nhân quyền cũng như thúc đẩy nhân quyền. Chúng tôi hy vọng rằng Việt Nam sẽ xem xét việc huỷ bỏ điều 258 để chứng tỏ cam kết của mình và đóng góp cho việc xúc tiến và bảo vệ nhân quyền, và chúng tôi hy vọng các thành viên Đại hội đồng Liên Hiệp Quốc sẽ thúc đẩy Việt Nam thực hiện điều đó trong thời gian vận động tranh cử. Chúng tôi yêu cầu Việt Nam thể hiện các cam kết về nhân quyền của họ như một ứng cử viên tốt trước cuộc bầu cử, để tạo điều kiện cho các thành viên Đại hội đồng Liên Hiệp Quốc đánh giá các cam kết nhân quyền của họ. Việc bãi bỏ điều 258 phải là một trong các cam kết đó. Như Tổng thư ký Liên Hợp Quốc Ban Ki-moon đã nói – “Tất cả các nạn nhân của việc vi phạm nhân quyền có thể trông cậy vào Hội đồng nhân quyền như một diễn đàn và một bàn đạp cho các hành động”. Là những người vận động cho tự do biểu đạt ở Việt Nam và là nạn nhân của các vi phạm nhân quyền vì các hoạt động của mình, chúng tôi xem việc ứng cử của Việt Nam vào Hội đồng Nhân quyền như một cơ sở cho các cuộc thảo luận có tính xây dựng về nhân quyền ở đất nước chúng tôi. In order to improve the protection of human rights in Vietnam, we will take HRC's principles as guidelines for our actions, which also comply with Vietnam’s obligations under international human rights law. - Continue to promote and inform the Vietnamese people about their rights by publicly distributing the Universal Declaration of Human Rights (UDHR), organizing public forums to discuss human rights in Vietnam and advocating for necessary improvements of the respect and protection of human rights. - Continue to monitor, publicly report and comment on improvement, setbacks, or violations of human rights in Vietnam, with a focus on policy and practice by the Vietnamese authorities that affect human rights. In order to fulfill these responsible actions, we call upon the Vietnamese government and the HRC to review Article 258 of the 1999 Penal Code of Vietnam, amended in 2009 - "crime of abusing democratic freedoms to infringe upon the interests of the State, the legitimate rights and interests of organizations and citizens." This article is in breach of the Article 19 of the UDHR: "Everyone has the right to freedom of opinion and expression; this right includes freedom to hold opinions without interference and to seek, receive and impart information and ideas through any media and regardless of frontiers." It would be a great responsibility to serve as a member state of the Human Rights Council, and an opportunity to promote human rights domestically and abroad. For a successful candidacy, we believe Vietnam must repeal or make amendments to Article 258 to ensure that Vietnamese people are free to educate themselves about and promote human rights. As said by Ban Ki-moon, UN Secretary-General - “All victims of human rights abuses should be able to look to the Human Rights Council as a forum and a springboard for action.” As advocates for freedom of expression in Vietnam and victims of human rights violations because of our activism, we view Vietnam's candidacy for the HRC as a platform for constructive human rights discussions in our country. Dưới đây là bài viết của tôi trên tờ Asia Sentinel, ngày 16/7/2013. Có buồn một chút, vì đó lại là bài phản ánh về tình hình "quản lý báo chí nước nhà" dẫn đến bức tranh tăm tối của truyền thông Việt Nam. Ước mong một ngày nào đó tôi có thể viết trên một tờ báo quốc tế nào đó những câu chuyện đẹp đẽ về Việt Nam... chứ không phải như thế này. This is my newly-published article on the Asia Sentinel. Usually it is very good of a Vietnamese journalist to find his/her article published on an international newspaper or journal. I feel a little sad, though, because this article of mine is about "the Vietnamese style of media control", which leads to the gloomy media picture of contemporary Vietnam. If only someday I could write for some international media agencies good stories about another Vietnam, a beautiful Vietnam where democracy and liberty were truly realized. If only that day came... then I would be really happy. 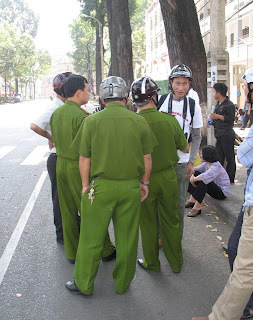 Every week in Hanoi the Central Propaganda Commission of the Vietnamese Communist Party, and in Ho Chi Minh City the commission's southern regional office, convene "guidance meetings" with the managing editors of the country's important national newspapers. Not incidentally, the editors are all party members. Officials of the Ministry of Information and the Ministry of Public Security are also present. Similar meetings take place in every province, a process emblematic of just how complete the control of the press is in Vietnam. At these meetings, someone from the Propaganda Commission rates each paper's performance during the previous week – commending those who have toed the line, reprimanding and sometimes punishing those who have strayed. In good cop/bad cop fashion, the party's overseers mix counseling and persuasion with threats and a bit of repression. Although there's no legal basis for it, the party regards the media as "propaganda forces" subject to its guidance and instruction. Probably the party itself recognizes the absurdity of this subjugation, which tramples on legal and journalistic principles. On the one hand the Propaganda Department instructs the "comrade editors and publishers" to make sure that the staff back in the office is "fully oriented," while on the other hand it insists that every one of them keeps the party's instructions strictly confidential. The existence and content of these weekly meetings sometimes leaks out into the blogosphere, the online forums beyond the reach of the Propaganda Department. On March 29, 2011, it seems, editors were instructed not to report that movie actress Hong Anh had declared her independent candidacy for a National Assembly seat, not to refer as "Doctor Vu" to dissident activist Cu Huy Ha Vu, then facing trial on charges of propagandizing against the state," to bury reports of that nine foreign tourists died when a Halong Bay tour boat capsized and to eschew investigation of the nation's decision to build a nuclear power plant. Vu's trial was the object of particularly heavy-handed guidance. Journalists covering it for major newspapers received unsigned notices on plain paper enjoining them to praise the impartiality of the judges and the correctness of the sentence, and to refrain from commentary or in-depth analysis. Telephone calls and oral instructions expedite guidance to editors on sensitive subjects. Don't report this incident, they're told; don't highlight that case, restrict coverage of these topics. Because no tangible evidence remains that the guidance was transmitted, when it's alleged that the press was gagged on such and such a story, the officials of the Ministry of Information can reply with straight faces that Vietnam is being slandered by "hostile forces." In a clandestine recording circulated soon after a guidance meeting in December 2012, Propaganda Department Vice Director Nguyen The Ky is heard rebuking the press for reporting that Chinese vessels had cut the cables of seismic gear being towed by a Vietnamese exploration ship. It doesn't matter that the reports cite sources in the state oil company and Foreign Ministry. "You must clarify that the Chinese vessels just unintentionally caused the cables to be broken," Ky said; "it was not an act of deliberate sabotage against us." The recording was immediately posted on dissident blogs and then on the Vietnamese language service of the BBC. Invited to comment, Ky told the BBC that he was only exchanging professional opinions with the editors. Clearly the Propaganda Department was mightily embarrassed by the leak. It's rumored that at the guidance meeting the following week, editors were subjected to a body search for hidden recording devices. The press card system is a sophisticated method of controlling reporters. No card, no access. Without a press card, reporters can interview ordinary people, but can't hope to meet high-ranking officials, visit contacts at public offices or cover official workshops or conferences. The system has been in operation for a long time. In 2007 it was legalized by government circular. The circular requires the issuing official to certify, inter alia, that a would-be journalist has been properly recommended by the paper, magazine or broadcaster that wishes to employ him, by the local Department of Information and the local branch of the Vietnam Journalists Association, and "has not been rebuked in the previous 12 months." The press card system illustrates the blurry boundary between Vietnam's state sector, its ruling party and civil society. Ostensibly the press is an institution of civil society, and newspapers, magazines and broadcasters are not official agencies. Legally speaking, in view of the Vietnamese Constitution's guarantee in Article 69 of "freedom of opinion and speech, freedom of the press, [and] the right to be informed", the state has no standing to regulate who is or is not a journalist, unless, of course, that promise is trumped by the State's obligation in Article 33 to "ban all activity in the field of . . . culture that is detrimental to national interests. . . ."
In any event, the Propaganda Department arrogates to itself that right, prescribing that Vietnam's media are the "voice of party organizations, State bodies and social organizations." Vietnam's Law on the Media further requires reporters to "propagandize, propagate the doctrine and policies of the party, the laws of the State, and national and world cultural, scientific and technical achievements in accordance with the guiding principles and aims of media organizations." The result is that a great many journalists are subject to the direction of apparatchiks whose capacity for communication is decidedly inferior to theirs. Without a press card, one is not recognized as a journalist and can be barred with no explanation at all from events at the whim of the organizing body, the police or civil authorities. Vietnam's authorities deliberately manipulate this situation. They seek to pit "right side" (press card-bearing) reporters against "left side" (free) reporters, including bloggers. They don't always succeed. The party's propaganda and security apparatus know better than anyone the power of secrecy. Openness and transparency are their enemy. Yet the controllers of information now face a new danger: card-carrying journalists are leaking suppressed stories to their colleagues in the blogosphere. On October 30 last year, Huyen Trang was detained and interrogated at a Ho Chi Minh City police station. When she explained that she was a reporter for the Catholic Church-affiliated Redemptorist News Service, police officers shouted at her "Who recognized you? Where is your press card? You are all a band of reactionary parasites!" Trang's experience is unexceptional. Free journalists are often harassed or even assaulted by the police or by ruffians. Their denunciations and complaints are ignored because they are not "journalists performing duties" in the eyes of the authorities. Dieu Cay and Ta Phong Tan are serving long prison terms chiefly because they organized a "Club of Free Journalists." Truong Duy Nhat quit his career as an official journalist to become a blogger. He was arrested on May 26 on a charge of "abusing democratic freedoms to infringe upon the interests of the State, the legitimate rights and interests of organizations and/or citizens" under Article 258 of the Penal Code. Hearing Nhat was in custody, the mainstream journalist Duc Hien commented on his Facebook page that "the thing is, a journalist must be able to access information. 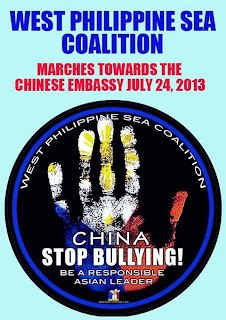 If he or she lacks the ability or opportunity to access information, his or her viewpoint will be only insults or libels or parroting others' opinions. . . ."
Hien's arrogant comment did not sit well with dissident bloggers, yet it must be conceded that he was right from the viewpoint of the authorities. Differential access to information creates a chasm between journalist and blogger and between a card-carrying journalist and an independent (free) one. Vietnam does not figure among the deadlier countries to be a journalist. The State doesn't need to kill journalists to control the media because by and large, Vietnam's press card-carrying journalists are not allowed to do work that is worth being killed for. Reporters are rarely independent and investigative; there is nothing close to anti-corruption journalism and therefore the press does not pose a danger to vested interests. A writer for the dissident blog Anh Ba Sam commented recently that "in this beautiful socialist country of ours, there are only two inner sanctums from which no secrets emerge. One is our prisons; the other is the party's politburo." That's absolutely right. Every matter that may erode the legitimacy of the regime or threaten the survival of the party is treated as a state secret or as a "special case." 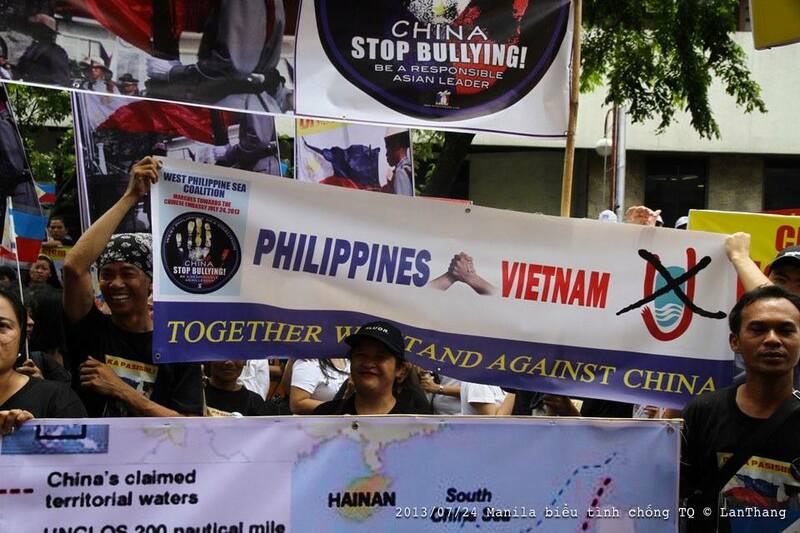 Chief among these in recent years is Vietnam's relationship with China. 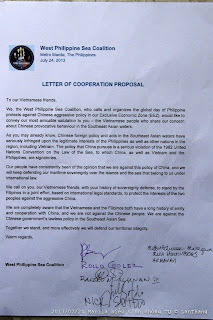 The press will never find a written explanation of the party's posture vis-a-vis its Chinese counterpart or a document addressing its management of the media in this matter. 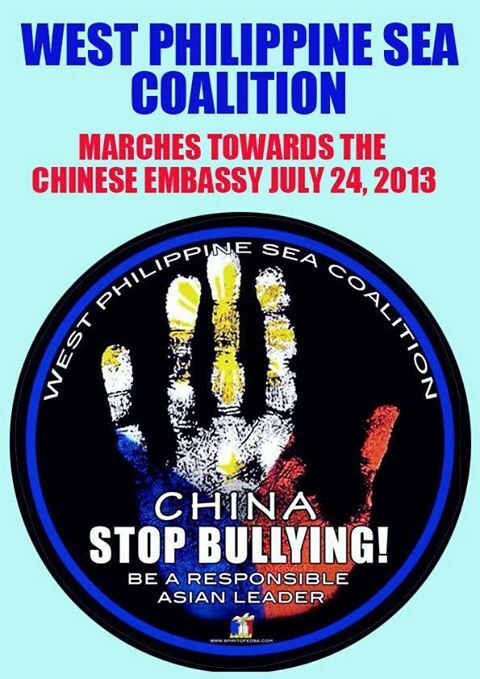 The public can perceive at best that this is a highly sensitive matter, proven by the occasional punishments meted out to media that stray over an invisible red line, by the lengths that organizers go to to limit reporters' access to international academic conferences on the South China Sea territorial disputes or by stipulations that reportage on anti-China street demonstrations must "expose the plots of reactionaries to exploit patriotic sentiment." The official media can see the regime's unease more clearly. It's expressed in the countless cautionary telephone calls to editors, publishers and even ordinary reporters when a story is breaking. The media are forbidden to relay this anxiety to the public, no matter how hungry readers are for insights on the deepening crisis with China. Gossip and rumor dominate the discourse. Conspiracy theories are widespread, for example the oft-heard notion that "the party has sold our national territory to China." Reporters who strive to remain rational and open-minded are starved for information they can use to rebut such rumors. Indeed, given that the press is barred from reporting all it knows, given the barrage of "guidance" by SMS, phone and vague directives, a truly rational journalist cannot help asking himself or herself: "What is the government really doing?" 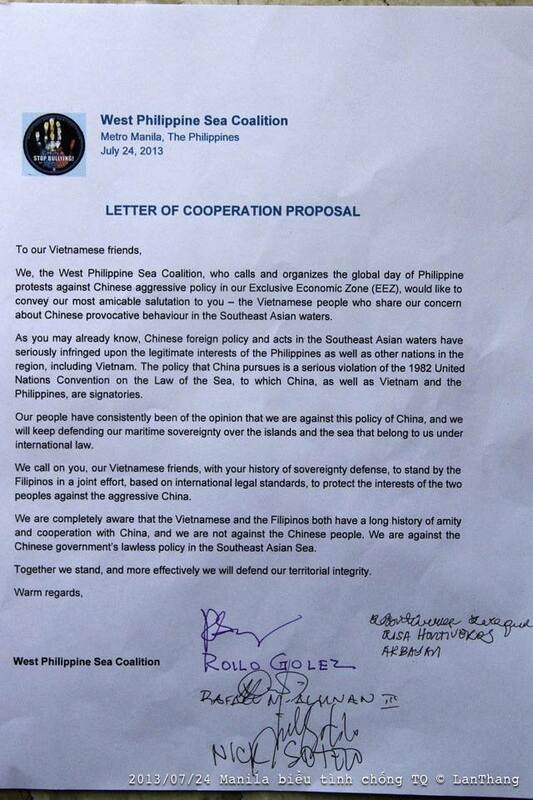 Coverage of South China Sea disputes becomes a forbidden fruit so appealing that some newspapers and journalists feel tempted to cross red lines to harvest it, although they may not have done proper spadework. Sovereignty disputes are an inherently challenging subject, and the press has few reliable experts and reference resources. There's truth, therefore, in Foreign Ministry spokeswoman Nguyen Phuong Nga's complaint that "some of the media appear to consider national sovereignty as a hot topic for building readership and increasing advertising revenues." Shocking headlines, unverified anecdotes and misleading "facts" crowd out quality reportage. Reporters search out sources with a strong bias against China. The poor quality of mainstream journalism provides the regime plenty of excuses to maintain its grip on the press, especially with regard to the South China Sea crisis. Defenders of the regime often argue that the answers are perfectly clear to those who really seek to become informed, e.g., if one is sufficiently concerned about the trend of Vietnam's relations with China, one must study harder. Put that way, the regime is under no obligation to be more transparent or informative in its dealings with the public or the national media.